I never understood the problem some people have with spiders, they’re helpful creatures! My bathroom used to be home to a spider that I named Cedric, he would scuttle around and spin webs in the corners. After Cedric died, his son Alfred took up his post (yes, I’ve named most of the spiders in my house). I remember when I was a kid, I was so thrilled one day to come home and find that a spider had spun a web on my bedside table. I feel the same way! We don’t have any spiders in the house because the cats eat them, but I’ve always thought they were cool. If I find one, I put it outside so it won’t be killed. I generally try to encourage them to stay up in the corners, and have all the flies and moths they can hold. Moving through a web is still a bit creepy and a nuisance; I have to wipe it off my hand/face/etc. In this hot WX we’ve had a real athlete in the front bathroom, but at least he scurries away when we disturb his rest. When my youngest daughter was born though, we had Black Widows living on the front porch, between the doorframe and siding; that called for the Raid. Sorry, guys, we’re just NOT going there. …and RAID worked!? When my family lived in Nevada, there were a dozen Black Widows near our house. A solid stream of RAID for 15 seconds staggered one of them for a minute but it got back up and kept going. It wasn’t even that easy to stomp them out. Terrifyingly resilient. My rules is bugs are left alone outside (with the exception of fire ant hills near the house or wasps along the edge of the house) but inside they take their lives into their own hands. Sometimes I carry them gently outside. Sometimes I squarsh ’em. That’s just the roulette game they’ve chosen to play. Personally, I’m fine with the spiders you can see and get to. It’s the ones you spot…and then they disappear into the carpet. Those will give me the willies for hours. I thought I was the only one who avoided eye contact etc. when “washing my hands” on road trips. More often then not, I’ll buy something just to make myself feel better. One day, you will make a quick bathroom break during a road trip, and find out the McDs is run by a nice family of Giant Mutant Spiders. 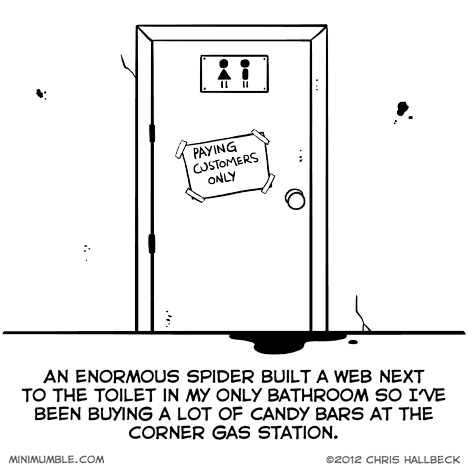 I think I’ll take the spider over the gas station restroom. Even if said spider is huge, hairy, and offering me fame in exchange for my soul, I’ll still take the spider. Gas station restrooms are where nightmares are spawned.